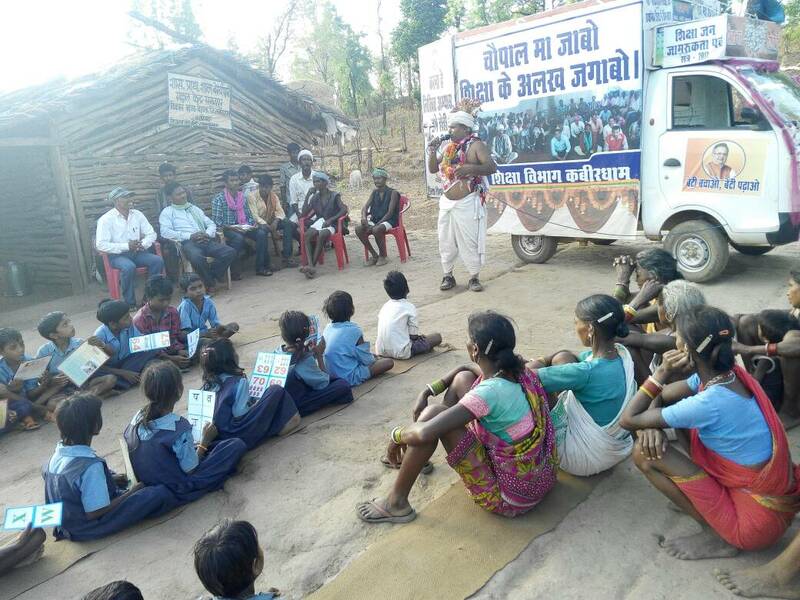 Dressed in a traditional tribal dress, a 45-year-old teacher from a government school in Chhattisgarh’s Kabirdham district is using a novel approach to highlight the importance of education in shaping a better future. Hemdhar Sahu has been travelling across the state as part of a Shiksha Rath campaign to highlight the quality of education in government schools and encourage enrolment of children in these schools. He has been doing this by raising slogans such as ‘school sarkari nahi hamari hai’ (it’s not the government’s school, it belongs to us), conducting public meetings, gathering crowds via a traditional dance performance, then talking to them about why they should send their children to school. 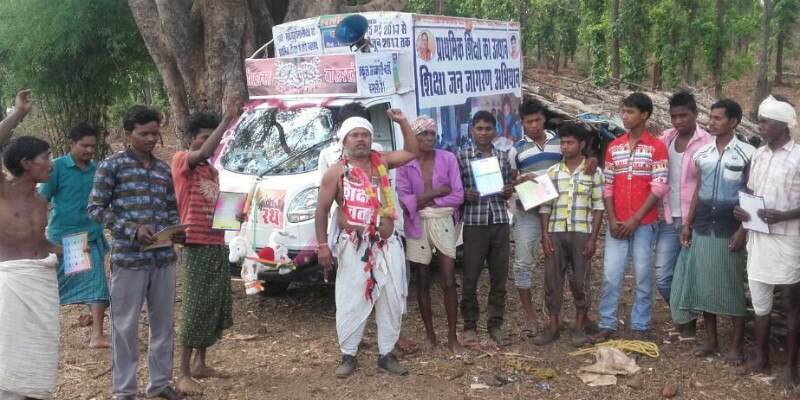 Owning to the success of his ‘Shiksha Rath’ campaign in Kabirdham district, Sahu was asked to replicate his campaign in Raigarh district of the state this summer where he conducted public meetings in around 100 villages. 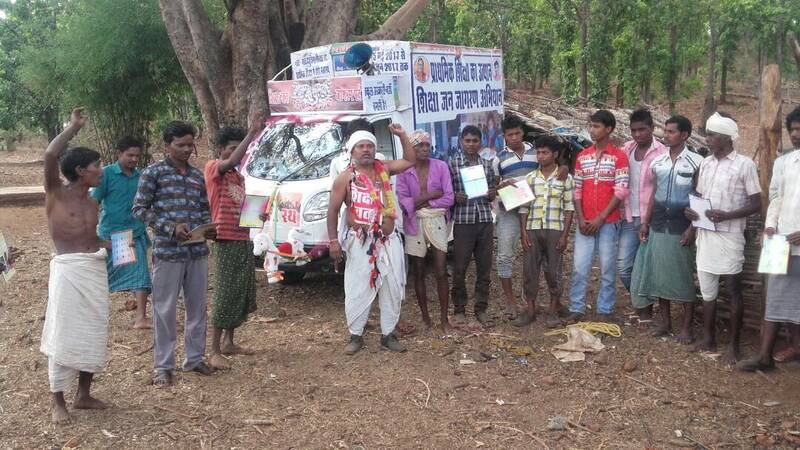 Obstacles like the rough terrain, dense forests, hot weather, threat of wild animals, and at times non-availability of clean water and food failed to deter Sahu, who has covered 1,000 km overall on this campaign. As a result of his Shiksha Rath campaign, the enrolment of children in government schools operational in Baiga-dominated and remote areas has increased. The lack of education is one of the reasons why Baiga tribes are still far away from progress, and that is why education is a must to uplift them, says the teacher who has over 25 years’ teaching experience. He believes that given a chance and proper guidance, children from the Baiga tribe have the potential to join the IAS or IPS one day. “During the campaign, I explain to villagers that government schools belong to people and their village. I also ask them to change their mindset that their responsibility towards a child ends after enrolling them in school,” added Sahu, elaborating that now, villagers are also monitoring their children’s activities on a regular basis. He further explained that when parents actively monitor their children’s activities, it makes the child feel special and encourages him / her to study better. While there are plenty of government initiatives that encourage education, including free education, free uniforms and study material and midday meal, all this will be fruitful only if there was active participation from both students and their parents. When visiting villages, Sahu keeps encouraging students and parents to focus on the written method of learning so that they can attempt maximum questions during examination. The success of the campaign can be attested by the improved results of government schools in the district. The campaign led to an increase in literacy rate and increase in enrolment number of children in government schools. In fact, there have been instances where villagers have pledged to ensure quality education to their children so that they can go on to have fulfilling, high-profile jobs.